In the early to mid-2000s, everyone was screaming for lighter carry guns. For a number of reasons, Smith & Wesson decided it would be awesome to offer some of their very popular L-frame and N-frame models with scandium frames and titanium cylinders, resulting in wrist destroying magnums like the 329PD, chambered in .44 Magnum. 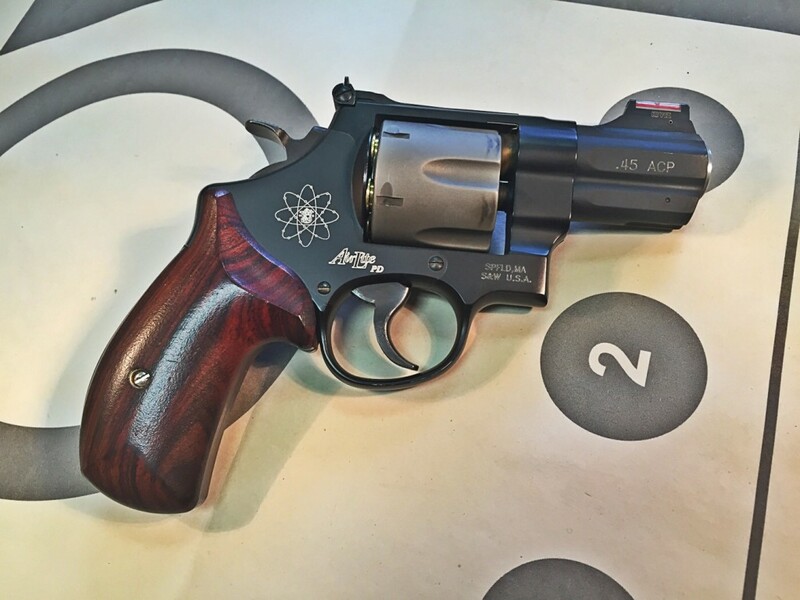 Of course, the Smith N-frame lineup also includes the legendary 625, the .45 ACP moonclip revolver. It was only natural to make a scandium framed, titanium cylindered version of that, resulting in the gun you see today, the Smith & Wesson 325PD. Perhaps unsurprisingly, the flyweight N-frames were not as big a hit as Smith would have hoped, and the 2.5 inch model of 325 was only produced for two years. The four inch gun soldiered on for another year after that, before being dropped. 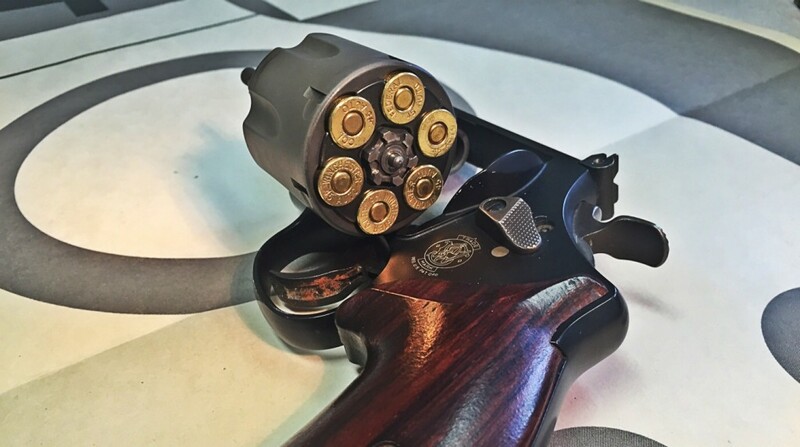 The idea of lightweight, large frame revolvers would make a brief return in 2009 with Smith & Wesson’s Nightguard series, which were largely similar to the PD guns, but dropped the Ti cylinder in favor of a more cost effective steel cylinder. In its short production run, the 325PD developed a reputation, best put into words by a friend of mine as a “kinetic bullet puller.” The reason for this is factory .45 ACP ammunition frequently isn’t crimped very tightly, so the recoil of a 230 grain bullet at 900 FPS could, depending on the brand of ammo selected, cause violent enough recoil that the bullets in the chambers would be pulled slightly from their case mouths. Still, even knowing that, I’ve always wanted one of these guns, so when I was browsing Gunbroker while tipsy, I put down a bid that I never expected I’d win. Uh, durr, it’s a .45 ACP moonclip revolver that weighs less than a volleyball. This gun is cool just from the viewpoint of a gun enthusiast. It represents a whole bunch of things that don’t make any sense, but were done “just because we can.” It’s like the Ariel Atom V8 – yes, there’s a reason for it, but that reason appears to “why not?” Of course, the first question anyone asks about this gun is “how’s the recoil?” Which is fair question, because it weighs just 22 ounces unloaded. That means that a full load of 230 grain cartridges increases the weight by 20% right there. Truth be told, recoil really isn’t that bad. Yes, you notice it, and no, I wouldn’t want to shoot an entire 1,000 round class with full house ammo, but you know what? It’s really not that bad. It’s not at all like shooting a similarly designed j-frame, because the large stocks and size of the gun give you more revolver to hold on to. More meat on the gun = better recoil control. Where this gun really comes alive is with lower pressure loads. I tested the 325PD extensively with Federal Gold Medal Match 185 grain semi-wadcutters along with some PNW Arms 185 grain minor PF ammo I had laying around from Bianchi Cup two years ago. With loads in the 130-140 power factor range, it was actually quite a lot of fun to shoot. Again, you definitely notice the recoil; but with those minor leads, recoil in the 325PD feels about the same as full house .45s do through a 4 inch 625. It’s also quite accurate. That’s a six shot group, fired with the 185 grain semi-wadcutters at a distance of 10 yards. 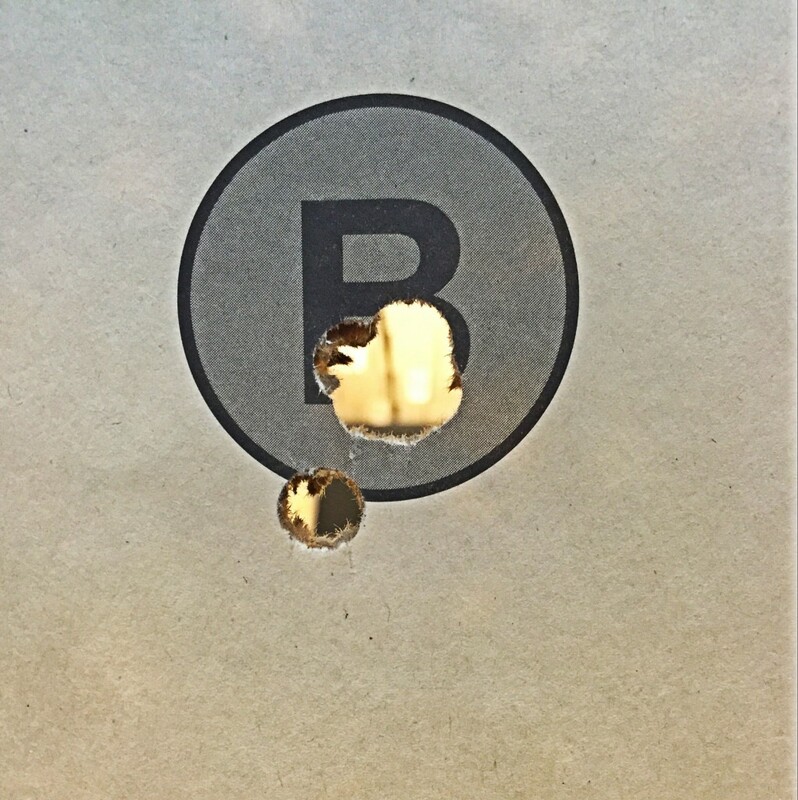 I know, 10 yard groups are kind of dumb, but I was at the end of my ammo and wanted to see if I could keep all the shots in the 2-inch dot at 10 yards. Success…and I wouldn’t worry about that little guy at the bottom. Here’s the gun nut stuff. The sights are good, but not great for precision shooting. They feature a big fiber optic pipe up front and a shallow v-notch in the rear. They are very fast, and very easy to pick up when shooting the gun quickly at ranges inside 7 yards. For accuracy work, I found I had to spend a bit more time than I’d like making sure they were lined up. The trigger is actually pretty good, a little heavier than I’d like, but smoother than the factory trigger was on my 929. I’ll still probably get an action job on this gun, just because the Apex guys are sorcelators and do amazing work. Plus, I’d like to get the enormous target hammer bobbed off this thing, which is a feature that doesn’t make a hell of a lot of sense on a carry gun like this. But because I know someone will ask, the DA trigger pull is about 10 pounds, and the SA is a very nice 4 pounds. Not that I’ve shot a single round out of this gun in single action, because that’s really not what it’s for. If I was going to be all dramatic, I’d say this is a serious gun for self-defense; but the truth is that it’s not. It’s actually kind of a silly gun, because it’s the size of a Glock 19, but it’s harder to shoot, holds less rounds, and is harder to reload. If it was a person it’d lick the windows and bark at shadows, and that’s really okay. It is absolutely the best scandium framed, titanium cylindered, 2.5 inch barreled .45 ACP moonclip revolver ever made; however it’s also the only one of those ever made. That’s alright. It would absolutely make a great carry gun for someone who wanted to invest the time and effort into mastering the trigger pull, the recoil, and the reloads. It is neat. It’s also a great gun, a fantastic shooter that I’d be willing to bet my life on if I needed to. 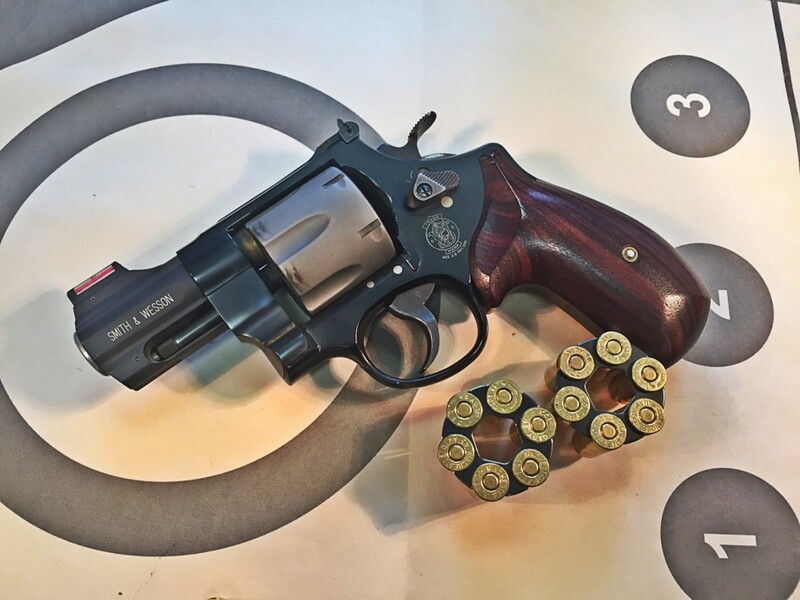 As the market for revolvers has shrunk in recent years while the overall CCW market has exploded, guns like the amazing, confusing, and ultimately wonderful Smith & Wesson 325PD will likely be regarded as curiosities of days gone by. Thanks for taking one for the team firing that revolver. Your ammo insights were great. I especially liked, “kinetic bullet puller” because stuff happens in shooting as in everything else. This combination is what it is and I am thankful S&W gave it a try. I tried to like my old 1917 but it was not for me either. So, Delta grip and use it for your FAST test? I know, I know, not really the gun for that. Although I would love to shoot one, among many others, I’m sticking (mostly) to the path of utilitarian firearms and no safe queens. Actually, that’s kind of what I’m thinking, but instead of the Delta I’d put some sweet beamz on it. Get some 180 grain LRN load ’em to about 700 FPS and go play. Gamer. I do not want to see you develop a new carry method for this that involves drawing from under your kilt, though. Glad to hear I’m not the only Gunbroker browser who bids after cocktails. I’m going to end up owning a PPK or another 3rd gen Smith if I’m not careful. I sometimes wish I hadn’t sold mine. Don’t tell anybody. This may make me guilty of being even more guilty of being a gun hipster than Caleb, but i actually own a 325 Thunder Ranch. My reasons were I wanted a .45 revolver, a PC revolver, and a revolver i could carry if I took a notion without it being as heavy as my 686p. I need to change out the front sight though, I’m apparently not a fan of the classic gold bead. Jay, I have a 327 Performance Center and I absolutely love it. 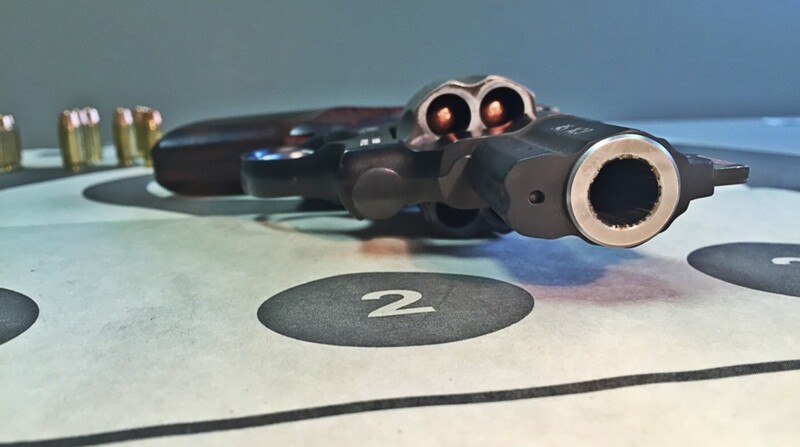 I’m not a huge revolver shooter like our esteemed author but that little “big” S&W is a joy to shoot, especially with serious full house loads. Plenty of recoil and completely controllable.